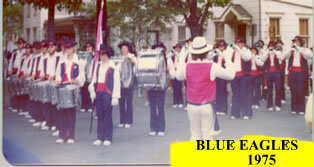 The Blue Eagles Alumni Drum and Bugle Corps, from Wind Gap, PA organized for the first time in 1948. 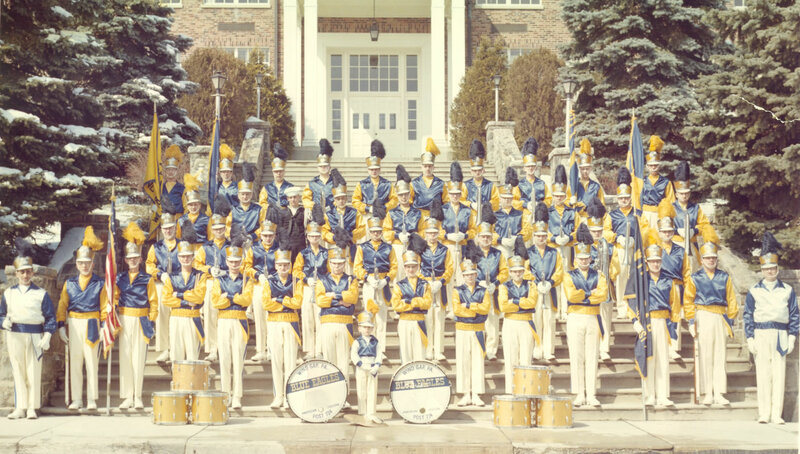 At this time equipment was purchased; snare drums cost $25.00 and straight bugles were $10.00.The original uniforms were made of Eisenhower jackets, black pants, with a white belt and a white helmet. These uniforms lasted until the late 50's, when a satin blue and gold blouse with white pants replaced the aging uniforms. The corps stuck with parades and an occasional standstill thru the early life of the corps. In the early 60's, the Blue Eagles expanded their program to an exhibition field show. The corps won numerous titles at this time. The corps membership dwindled during the Vietnam conflict, but cross-town rivals, The Bangor Yellow Jackets, had the same problem. The two corps combined ,but due to struggling management, both corps folded. The corps emerged again in 1973, and by 1975, they were the Pennsylvania American Legion parade champions. By the late 70's the corps membership had swelled to 110 members ,competing in the DCA and ICA circuits. By 1980, the curtain fell again on the corps, due to the large debt the corps incurred, along with internal problems. The Borough of Wind Gap was planning a Centennial Celebration in 1993. Some of the former corps members decided to gather an alumni corps one more time. Starting with their old corps home, American Legion Post 724 of Wind Gap, the corps started preparing in September of 1992 for the big event. At this time the corps decided to stay as an alumni corps, performing only at parades and standstills. 1998 brought about a new era. The corps purchased new 3-valve horns and a new equipment trailer was acquired. The corps performed in its first DCA standstill exhibition in Stroudsburg, PA., and participated in the DCA parade in Allentown, PA. A total of 17 parades and 5 standstills completed the 1998 season. Currently, weekly rehearsals have seen the horn line slowly growing and adding a few old faces as well as new recruits. The music continues to range from popular show tunes and patriotic numbers to latin, jazz and big band. Musical arrangements have been by Larry Kerchner, Joe Itkor, Doreen Sandor, and the late greats: Tom Swan, John Arietano, Jim Prime, Sr., Joe Gennero and Tru Crawford.